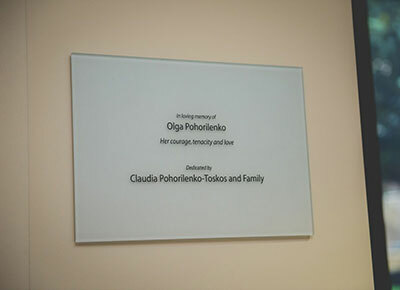 The beautiful plaque inside the Marion-Louise Saltzman Women’s Center commemorating the gift honoring the life of Olga Pohorilenko. Sometimes, the bond between patient and caregiver transcends a “doctor-patient” relationship. Sometimes, the care a physician, nurse or therapist provides goes above and beyond in a way that leaves a lasting and indelible mark of comfort during a time of uncertainty, confusion and anxiety. Unbeknownst to the caregiver, they have created a bond. For them, it may be all in a day’s work, but for the patient and their family it is so much more. Cancer eventually claimed Olga’s life, but the relationship developed between her family and Dr. Jablon would lead to a partnership that has brought life to Olga’s legacy. A legacy which is already changing lives. The Pohorilenko Family gathers to celebrate the life of family matriarch, Olga Pohorilenko. Her daughter, Claudia Pohorilenko-Toskos, spearheaded the family’s efforts to raise the funds donated in her mother’s name. 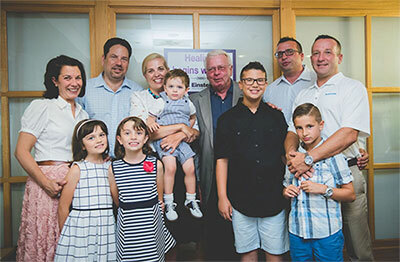 In honor of Olga and to show their overwhelming appreciation for the care Dr. Jablon provided during her life, Claudia and her siblings decided to raise funds to donate to Einstein’s Breast Health Program. When approached with this idea and asked what the money could be used for, Jablon knew exactly what she wanted to help improve her ability to treat women with breast cancer. With the generous support of the Pohorilenko Family, Einstein Medical Center Philadelphia purchased the MarginProbe® System and became the first hospital in Philadelphia to offer brand-new technology to enhance the care they provide their patients. 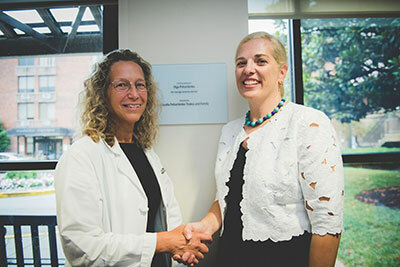 Lisa Jablon, MD, Director of Einstein’s Breast Health Program, thanks Claudia Pohorilenko-Toskos, for the family’s generous donation which facilitated acquisition of the MarginProbe® System. If you would like to honor an inspired caregiver, please contact Mary Shaffer at 215-456-7236 or shafferm@einstein.edu.